I heard a story about a little girl who was blind from birth. Her mother constantly tried to describe the beauty of the world. She would describe the color of a flower, talk about the glory of a sunrise or a sunset, try to describe colors of the mountains, and so forth. The true greatness of the believer’s eternal destination can’t be captured with words because it is just so wonderful. So as you look forward to living forever with Christ, do so with the expectation that you’re going to experience something better than you could ever imagine! AS YOU LOOK FORWARD TO YOUR ETERNAL HOME WITH CHRIST, REMEMBER THAT IT WILL BE BETTER THAN WORDS COULD EVER DESCRIBE! 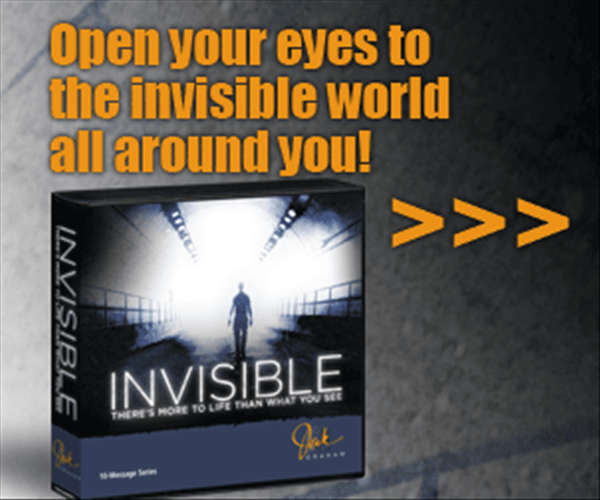 Understand what’s visible by unveiling the Invisible! While so many people today only focus on what’s visible, there’s an invisible realm that’s just as real and just as active as the physical world you see. Yet as you go about your daily life, it can be easy to forget that truth, which puts you right in the crosshairs of the evil one. In this eye-opening 10-message series called Invisible, you’ll come along with me as I exploresuch topics as the existence of angels, the battle for your mind, and what heaven is really like. After hearing it, you’ll be better equipped to have real victory in the spiritual realm! I want to send youInvisible to thank you for your online donation to PowerPoint today. I know you’ll never see your physical world the same once you unveil the Invisible! Thank you for your gift. I’m so grateful for you!